Conflicts over water are on the rise in India, but climate change is not the only culprit. Fiona Broom reports on a powerful water mafia that is sucking India dry. When water supplies run dry in his village, Shiva Korade attempts to make a living selling sugarcane juice in nearby Pune. For 12 hours a day, Shiva Korade stands in the blistering sun selling sugarcane juice at the roadside. He can’t afford a mechanized juicer; instead, he and his fellow villagers take it in turns running in a circle to push the arm that operates the press. Korade comes from Jalna, a water-deprived district in Maharashtra state. Every summer his village is emptied of its able-bodied residents. They make their way to Pune, one of India’s largest cities, where they rent rooms together and peddle juice, vegetables and street food. This is a story repeated across India. Since the monsoons began to fail in 2012, conflict over meagre water resources and farmer migration in search of employment has increased exponentially. But the successive meteorological droughts, blamed by many on climate change, are not the only cause of India’s water scarcity problems. ‘We are in the midst of a mega water crisis that is not one year old, not one season old, but 20 years old,’ veteran rural affairs reporter P Sainath told the National Consultation on Drought last year. Back in 1996 Sainath published Everybody Loves a Good Drought, which detailed how commercial operations exploited water resources, while struggling farmers and rural citizens, lacking both access to a water source and government assistance, were forced to pay exorbitant prices for paltry deliveries. Little has changed since then. The ‘water mafia’ and ‘tanker mafia’ continue to boom while authorities ignore local water-security schemes, favouring big dam projects instead. This, Sainath says, is the thirst economy. The borewell industry also does well out of droughts. With no irrigation canals, the villagers of Jalna, in the historically parched Marathwada region, rely on water drawn from wells. In desperation, they continue to hire expensive machinery to dig new borewells at random in the hope of striking water. Aquifers and groundwater reserves across India are becoming so depleted that wells must be dug deeper and deeper – Khedekar and Korade say they’re digging down to 90 metres now. Due to over-extraction, rivers and streams that rely on groundwater are drying up. Desertification is taking hold in areas such as Tamil Nadu state, which many observers say is suffering its worst drought in 140 years. Environmentalists fear for the future of Kerala’s Bharathapuzha river, where farmers recently sank borewells into the dry river bed. This despite an above-average summer monsoon fall – the downpour failed to recharge Kerala’s groundwater and aquifers, as deforestation causes rainfall to run off into the sea. ‘Groundwater feeds more than two-thirds of irrigation areas, supplies more than 85 per cent of rural domestic water, more than 60 per cent of urban domestic water, and more than 55 per cent of industrial water,’ says Himanshu Thakkar, an engineer-turned-activist and co-founder of South Asia Network On Dams, Rivers and People. ‘This is a failure of governments. The resources establishment continues to depend on the big irrigation projects and dams and when those are exhausted they talk about river linking [enormous civil engineering projects to link rivers by canals and reservoirs]. This ignores the reality that India’s lifeline is not river linking or canals or dams: it’s groundwater and the dependence is huge.’ Rooftop rainwater harvesting could provide some relief on a local scale in urban areas, Thakkar says, but rural areas need more robust systems. Inappropriate cropping patterns also have a large part to play in the paucity of water. Maharashtra, which has suffered the worst effects of recent failed monsoons, is the second-largest sugarcane-growing state in the country – much of it grown in highly unsuitable dry districts. This is down to ‘sugar politics’ – irrigation water is allocated to the districts of the most powerful politicians, who are also often cabinet ministers and sugar factory owners.3 This diversion of water from staple crops to sugarcane lays bare India’s structural power imbalances. 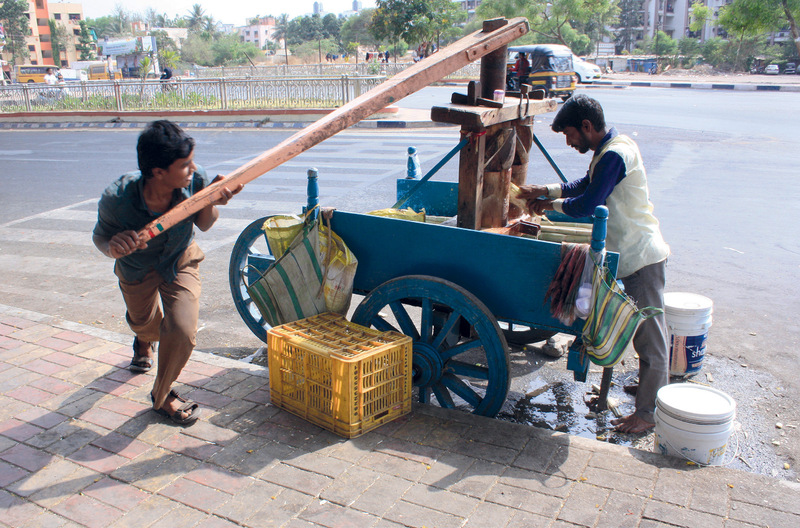 It is a grim irony that villagers from Jalna and many other areas of Maharashtra sell sugarcane juice in the cities when their water supplies run dry. As evening sets in across Pune, the sun disappears but the heat remains, as do the villagers, who continue to turn the wheel of their sugarcane press in the hope of making another few rupees. Korade says he doesn’t know whether he can continue to call Jalna home, or will have to migrate permanently to the city. ‘It solely depends on water and the next monsoon,’ he says. Census data shows millions have quit farming in recent years. The Internal Displacement Monitoring Centre recognizes the difficulty in counting those fleeing slow-onset disasters, such as drought. But the centre says communities that are unable to manage severe or recurrent impacts of water scarcity are vulnerable to displacement, particularly when food and livelihoods are reliant on rain-fed agriculture, as is the case in many parts of India. Last year, displacement camps were set up in Mumbai to accommodate hundreds of families fleeing drought. The Centre for the Study of Developing Societies’ 2014 State of Indian Farmers report found that in the preceding three years 70 per cent of farmers had suffered crop failure, primarily due to changes in rainfall patterns, drought and lack of access to irrigation. Some said they saw no point in returning home. Studies and farmer surveys show many do not want their children to follow them into agriculture, instead hoping they get an education and a job in the city. The factors that lead to migration are as complex as those that contribute to the staggeringly high numbers of farmer suicides, a tragedy driven by the key pressures of indebtedness and crop failure. In recent years Maharashtra has continuously registered the highest number of farmer suicides, with Vidarbha and Marathwada – where industry and the sugar mafia dominate – suffering the greatest losses. Pulkoti is an oasis in the semi-desert of western Maharashtra. The area receives just 175 millimetres of rain annually, but it hasn’t needed a single tanker delivery since 2014. 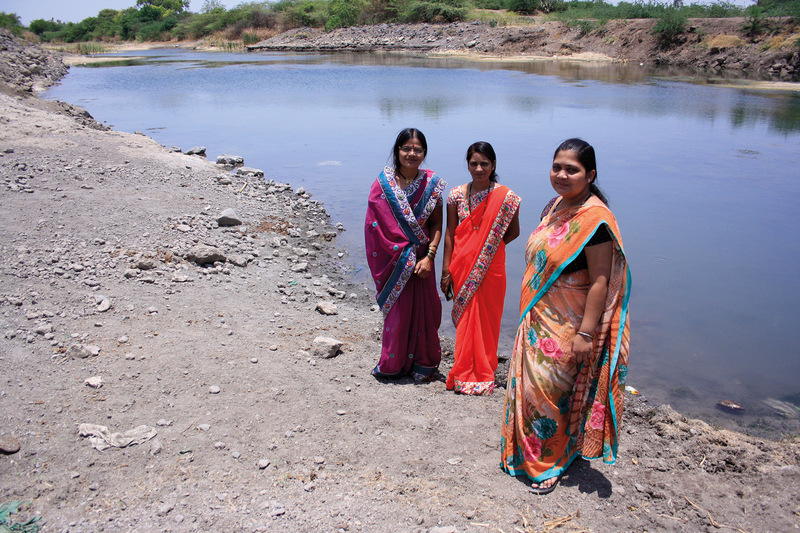 With the help of a determined women’s organization, the Mann Deshi Foundation, villagers found a seemingly simple solution to their water problems.